The Caucus of Rank and File Educators (CORE) "Testing Task Force" met for the first time on January 20, 2010. Convened by CORE after reports from the teachers union of British Columbia that the union there is sponsoring a moratorium on high stakes standardized testing, the CORE task force outlined an ambitious agenda. CORE is a caucus in the Chicago Teachers Union. The January 20, 2010 meeting began with members of the committee outlining the harm caused by high-stakes standardized testing. Three of the members of the CORE testing task force helped lead a discussion of the problems with high-stakes standardized testing at the January 10, 2010, CORE "Education Summit" at Malcolm X College in Chicago. 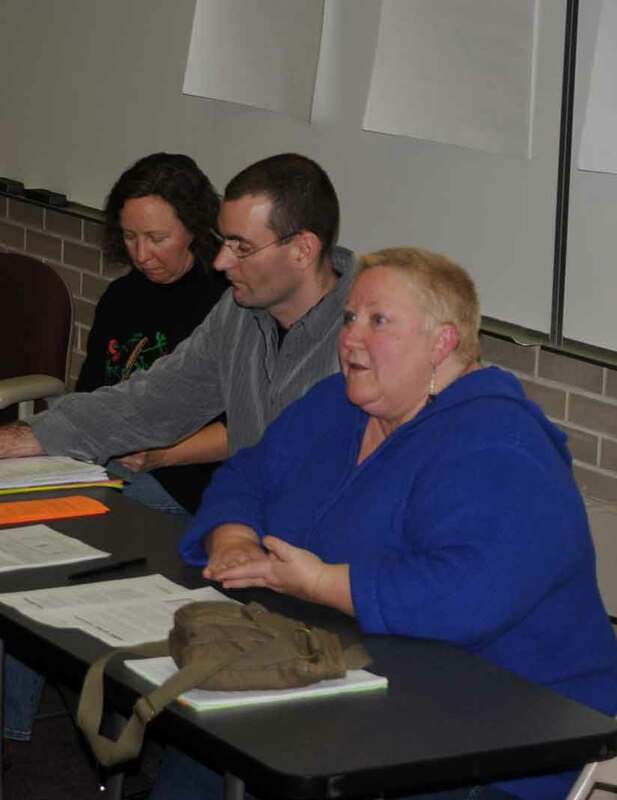 Above are (left to right), Susan Zupan, Wade Tillett, and Julie Woestehoff. Substance photo by George N. Schmidt. • Thousands of teachers have been fired since 1999 when CPS began using test scores to judge teacher quality and reconstitute schools. The latest casualties will be the staff of schools that the board votes on at the February meeting of the Chicago Board of Education. At least 180 classroom teachers at five schools (including Marshall and Phillips high schools) face termination because of test-based "turnaround" proposals. • Students are physically and emotionally stressed by test pressure, adversely affected by grade retention and rankings based on test scores, and cheated by a narrow curriculum dictated by tests. • Teachers are unable to give quality instruction to their students due to the time and importance placed on testing. • The Chicago Board of Education is funneling millions of dollars to the test companies and other private interests that benefit from school takeovers. CORE members on the Testing Task Force discussed plans for action. “We need to lead a resistance movement,” CORE presidential candidate Karen Lewis said. Lewis, a teacher and union delegate at Chicago's Martin Luther King Jr. College Prep High School, said that she had spent a day reading postings on Susan Ohanian's Web site. “This is a train we have to stand in front of,” Whittier Elementary School teacher Norine Gutekanst said. CORE members asserted that it shouldn’t take Chicago that long. “Teachers are at a tipping point,” Susan Zupan, a 20-year elementary school teacher currently at Taylor Elementary School, said. CORE will begin the work of the Testing Task Force by compiling and sharing the information of high-stakes testing with union members. Teachers need to know the staggering number of tests forced on students from kindergarten through 12th grade and what the stakes are for children and school workers. CORE will educate teachers on the fallacies, flaws and harmful effects of high-stakes testing. Testing Task Force chair elementary school teacher Wade Tillett said teachers also need to be able to articulate what schools could be without the interference of the current testing mania. Tillett lists the following things that could be in place in schools on his website www.bubbleover.net. In addition to raising awareness, CORE Testing Task Force members plan to lead a push for legislative change. Julie Weostehoff (of Parents United for Responsible Schools (PURE) said at the meeting that she hoped teachers and parents could come together to demand that tests in Illinois become public after administration (as they are in Massachusetts, Texas, and New York) and that parents obtain the legal right to opt out their children from testing. Doesn't CTU have a committee on testing? Doesn't the Chicago Teachers Union have some kind of committee researching and exposing the abuses of standardized testing in Chicago? Substance editor George Schmidt posted this comment in a thread following the January 16 "Media Watch: No News is Typical" article on this home page. No one understands and articulates the harm of high stakes testing like George Schmidt. The following paragraphs say what I wish our union leaders could say about these horrors. "Raising test scores" has nothing to do with good schools. The "best" schools in Chicago are those that cream off the top students, and as a result their teachers never have to worry about being slandered, then fired, after a career of dedication to the children who've been left behind by the USA and the vicious Darwinianism explicit in the entire test score hoax. As Fair Test reports every year, test scores on all standardized tests correlate directly to family income. The wealthier the family, the higher the test scores. While there are a few minor (and not really relevant) statistical exceptions, they are "outliers" and have no relevance to the major fact. Test scores in general -- on average, in the real world -- measure wealth or poverty. It's a cruel hoax to lead teachers, families and students to believe that the students and teachers at Marshall High School, which serves the harshest poverty on the West Side, can "raise" test scores to compete with Whitney Young (where my eldest son graduated in 2007) or New Trier. The entire "achievement gap" is part of this hoax. There is a wealth gap, a health gap, a nutrition gap, and about a dozen other gaps in capitalist America, but as long as the majority of teachers can be conned into believing that their problem is the "achievement gap" we are never going to be organized to fight back. Focus on educating the children where they are and based on the needs they face, both educationally and otherwise. That's what we did back in the day when everyone knew that teaching at a segregated all-poverty school like Marshall High School was a vocation that was not for everyone. Before all the definitions were changed, and the segregationists like Arne Duncan, Richard M. Daley, and Ron Huberman were given the green light to take us back to the 1890s, the last "Gilded Age." But if you want to continue talking about "raising test scores" as if that had anything to do with the realities around Adams and Kedzie (Marshall) or 39th and King (Phillips), we can't have much of a conversation. Next you'll be telling me how you know how to "win" at the slot machines, or by playing the lottery. When the odds are overwhelmingly against you, the only way to win is to change the game, starting by not playing along with the lies. It's time for people to get together, throw out these lies from their minds, and join in some outrage. Since Arne Duncan was put in power at CPS, these lies have gotten worse and worse. This is the year to stop them all. This is about hearts and minds. And as the man once said, "Free your mind and your [rest of you] will follow." good article on what teachers in other places are doing. here in chicago we can not even control our own union that openly works against its members. The head teachers' union leader, Mick Brookes, said the primary school tests unfairly labelled some schools as "failing". The National Union of Teachers and the National Association of Head Teachers have called on the government to scrap the tests, saying they narrow learning. Ministers said they had ended some tests and strengthened assessments. This ballot to stop the Sats could set these teachers' union on a collision course with the government in the run up to the general election. However the other large classroom teachers' union - the NASUWT - says it wants to keep the tests. But the NUT and NAHT are now pressing ahead with plans for a full ballot of members after indicative ballots at the end of last year showed widespread support for a boycott. In a joint statement, the NUT and NAHT said the action, short of a strike, would be intended to "frustrate the administration of Sats". NUT general secretary Christine Blower said: "The lack of a positive response from government is disappointing. We want to avoid industrial action and call upon the government, even at this late stage, to enter into meaningful talks." Mick Brookes, NAHT general secretary, said: "The current system has resulted in thousands of children moving to the next phase with misleading information about their ability. "It has also led quite unjustifiably, to schools and their communities being labelled as 'failing' with the consequence of damaging recruitment of head teachers and worsening their working environment." If a boycott goes ahead, children would attend school during Sats week in early May, but instead of taking tests they would have a normal school week. Both unions said they give parents an "absolute guarantee" that their child's progress will still be accurately reported by schools taking part in a boycott, and the information passed on to secondary schools. The Sats tests are only taken by pupils in England - and not in Wales, Scotland or Northern Ireland. In previous years, pupils have taken tests in English, maths and science - but the test for science has been removed. A Department for Children, Schools and Families spokesman said it was piloting an alternative system of testing and that it was investing £150m in expanding and strengthening teacher assessment in schools.